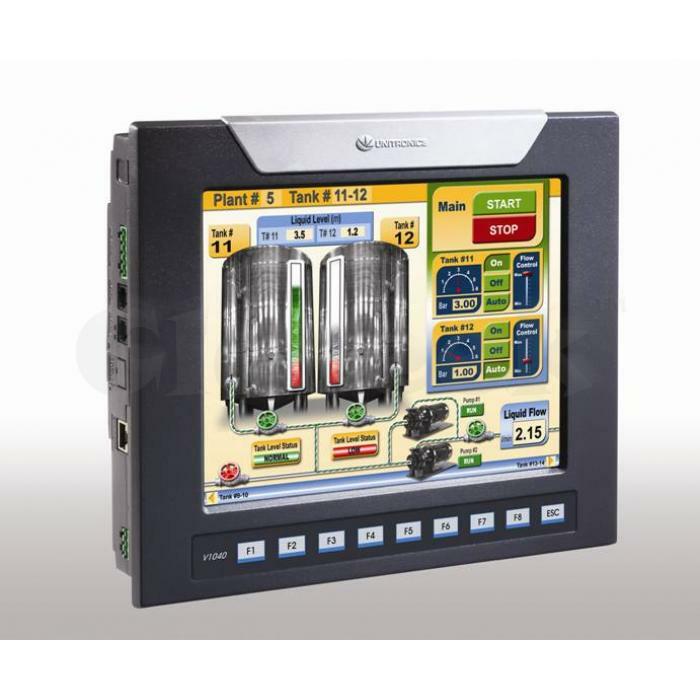 The Vision1040™ is a powerful PLC with a built-in HMI Operator Panel comprising a 10.4” color touch-screen and nine programmable function keys. On-board I/Os can be added by simply snapping a module onto the back of the PLC; Snap-in I/O Modules come in several configurations. I/O Expansion modules enable integrating up to 1024 I/Os per Vision PLC. The Vision1040™ offers a rich range of embedded features such as multiple auto-tuned PID loops, and internal 120K databases for datalogging and recipe programming. Communication options include TCP/IP Ethernet, GSM/SMS, MODBUS and CANopen networking plus remote access for data acquisition and program download. In addition this is the first Vision controller to comprise a USB programming port. 2MB Ladder code application memory (plus 32MB for images and 1MB for fonts) enable the Vision1040™ to run complex control and automation tasks. The 16-bit 65,000-color touch-screen HMI enables the display of color-coded operator instructions and red, attention-grabbing alarm screens. It can also display graphs according to historical values—to reflect trends of recorded data. Display options are almost endless with more than 1000 user-designed screens, and up to 500 images per application.